I have been wanting to try this recipe since I saw it on Pinterest, and today, I made it happen! Recipe below! 2. Cook the pasta al dente in a large stockpot of well-salted boiling according to package instructions. Drain. 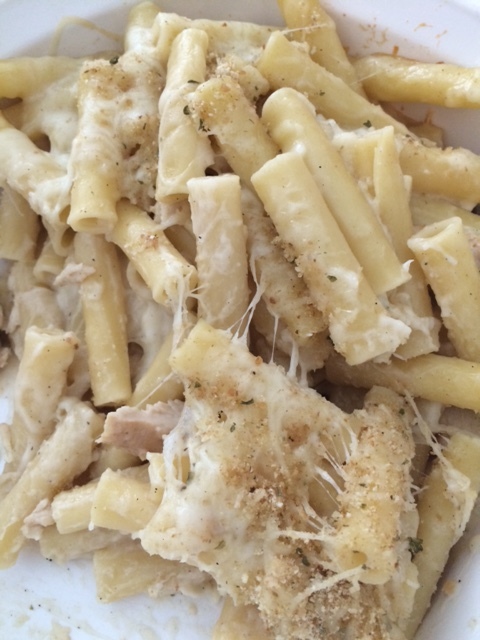 Return pasta to the stockpot and add chicken and alfredo sauce. Gently toss to combine until the pasta is evenly coated. 3. Pour half of the pasta into a greased 11×7-inch or 9×13-inch baking dish. Sprinkle evenly with 1 cup of cheese. Layer the remaining half of the pasta evenly on top. Sprinkle evenly with the remaining 1/2 cup of cheese. 4. Bake for 20-25 minutes until the cheese is melted and just barely starts to turn golden. Remove and serve immediately, sprinkled with additional toppings if desired. 1. Heat olive oil in a large saute pan over medium-high heat. Add garlic and saute one minute, stirring occasionally, until fragrant. Sprinkle with flour, and stir to combine. Saute for an additional minute to cook the flour, stirring occasionally. 2. Slowly add chicken broth, whisking to combine until smooth. Whisk in milk, and bring the mixture to a simmer. Let cook for an additional minute until thickened, then stir in Parmesan cheese, salt and pepper until the cheese melted. Remove from heat and set aside. It was a hit! I was nervous it would turn out dry because there didn’t seem to be a lot of sauce, but it was perfect! It probably could also have used more chicken, but I kind of liked it with just the noodles. Everyone seemed to like it so I guess I did my job. I also now have lunch for 3 days! That my friends is always a plus! Nice, I remember my first attempt at this dish before I started working at my pasta restaurant, and I was a nervous wreck. But I love that feelig of success when everything comes together. I really hungry now Lol!